A brilliant presentation example about fruits. 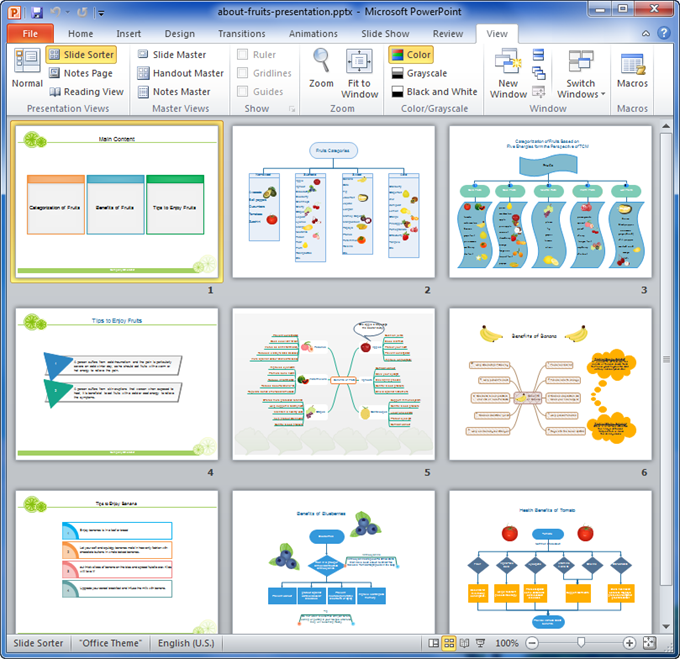 Download it for free to improve your presentation or use is as a template to present other topics. This presentation example is innovative for the highly artistic blend of color, shape and visual diagrams. Applying visual diagrams to enhance information communication is quite effective, such as mind map and tree charts. These slides will surely help you deliver wow and help your audience enjoy fruits better. To draw diagrams like those shown in the presentation, try our amazingly powerful diagramming software. You can also use this ppt example as a templates. Double click the text boxes to replace the content. The shape size, color and background can all be edited. Try some out-of-the-box methods to make your slideshow unique and catchy. Uses a minimal method which means less is more. Less words in each slide. Insert high definition images as backgrounds. Everybody gets your point easily in an instant. Apply visually pleasing Infographics to educate and entertain the audience. Implement the art of storytelling. Both children and adults love stories. Use large fonts and bold colors.